It happens with lightning speed. There’s no time to think or react. A bullet whizzes through the air. A bomb explodes. Everything goes black. After the initial silence, sirens scream, medics spring into action, helicopters whir overhead. And a young person, often barely 18, is rushed to hospital. It is the way of life for soldiers in the Israel Defense Forces and for all Israelis. It is the nightmare they face every day. 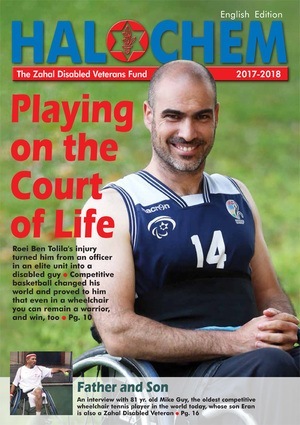 After the surgeries and painful treatments, it is Beit Halochem that takes over – to heal, provide therapies, offer a comforting shoulder, lift a broken spirit.Your donations are needed to help support the ongoing rehabilitation of Israel’s Disabled Veterans and Victims of Terror. You can give them hope for recovery when you make a donation in honor or memory of a loved one.You may wish to use the following giving levels as a guide: $36 – $72 – $100 – $180 – $360 – $500 – $1000 – $1800 – $3600. Planned Giving: We are pleased to be able to offer you a new, comprehensive range of planned giving options. Please contact Ella Levine for stock, bond, and planned giving information. Telephone: 212-689-3220. Matching Gifts: You can double or triple the value of your gift by checking with your employer regarding matching gift programs. Stocks: FIDV accepts donations of stock. Please contact Ella Levine. Telephone: 212-689-3220. Israel Bonds: FIDV accepts donations of Israel Bonds.